Clear audio reproduction with low rubbing and handling noise is a result of the EMW's omnidirectional polar pattern. The shelved frequency response features a smooth +6 dB boost between 2 and 15 kHz. This is the standard response for lavaliers worn on the outside of clothing (lapels, jackets, etc). A wide variety of colors and connectors are available for use with various wireless transmitters. This version is beige and features a Switchcraft TA3-female connector for use with AKG wireless transmitters. The EMW is available in three frequency response types and this version features a shelved frequency response that compensates for reflections lost when mounted on the outside of clothing and fabric. The shelved response is standard for lavalier microphones worn on lapels, jackets, etc. 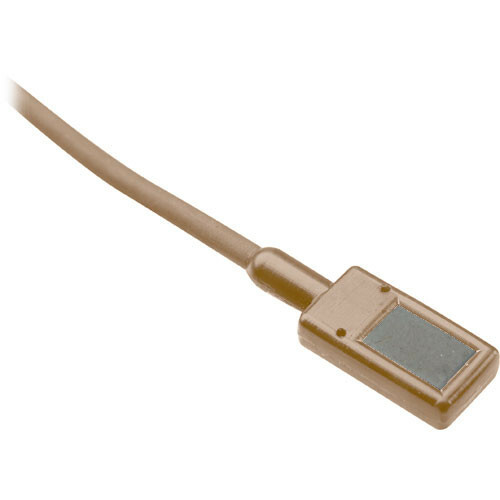 The square EMW lavalier is available in a variety of colors that virtually render the entire microphone invisible against the skin, allowing you to select the version that is best suited for your application. The EMW is credited for providing pristine audio with minimal handling and rubbing noise, due to its omnidirectional polar pattern.